Many UK students consider internship experience to be critical in their preparation for the professional world. A Lexington-based company, Lexmark Inc., consistently facilitates students from various majors into its internship positions. One student, however, took this longstanding relationship with Lexmark one step farther, or approximately 7,400 miles farther, geographically speaking. Hannah Simms is a junior at UK, majoring in international studies and political science with a minor in Chinese studies, as well as a member of the UK Honors Program. This past summer Simms spent three months in China, the bulk of which she devoted to working an internship with Lexmark's Shenzhen branch. Completing what she dubs a "professional rotation," Simms collaborated with various Lexmark-Shenzhen departments, including supply-based management (SBM), the service parts team and the human resources department over a 2-month period. "Working with the service parts team was fascinating, because they work on maintaining relationships with suppliers to make sure parts are available to customers, and that was interesting to witness in the context of another culture," Simms said. 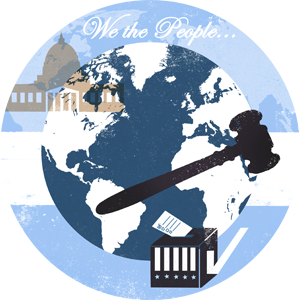 "However, working with the HR team aligned with my interests the most, because my primary interest is law and the legal side of all of this, so I was able to broaden my understanding of contract negotiation, litigation, settlements and those kinds of things." Simms said she feels very confident her experience will benefit her in her future job search. "I got to really see and participate in the long process of contract negotiations, and to see how the process originates, how contracts are written, how they are negotiated and what goes in to play," Simms said. "That’s the kind of experience you typically don't get until you are already in the workforce, so I'm absolutely thrilled to have been able to experience, as a rising junior, all of those different areas of the supply chain. I think it is going to make me a strong professional, when I get to that point." Outside of the business skills that she gained, Simms said that one of the most valuable skills she acquired was the ability to adapt to an international working environment. As she aspires to work in an international setting, whether in the law or business field, she's confident that her successful acclimation to the culture of a Chinese business laid the groundwork for her to adapt to any international setting. Assistant provost for international programs Susan Carvalho echoed Simms' sentiment in regard to global experience. "In addition to all of the benefits of global awareness and personal growth, the kind of experience that Hannah had gives her the skills that future employers like to see," Carvalho said. "Employers have become aware that the skills they want in new hires—creativity, adaptability, awareness of differences in perspective and ability to bridge communication gaps—are honed during international study, especially the kind of international work that puts US students in the midst of global workplaces." Having established this internship by working with local Lexmark officials directly, Simms said she hopes her experience can serve as a pilot program, allowing other students to work with international Lexmark branches. As UK continues to strengthen its relationships with partner institutions across China, and send more UK students through education abroad programs in the region, Simms' wish poses a true possibility. In December 2011, UK signed a joint-venture agreement with Shanghai University to pioneer an American Studies Center on the SU campus, funded by a grant from The Public Affairs Section of the U.S. Embassy in Beijing. The facility aims to broaden Chinese understanding of American culture and to foster intellectual and cultural exchange. UK's primary contribution involves providing a perspective of the American South and Appalachia. While Simms was in China, she participated in a week-long cultural exchange summit at the American Studies Center, which united 12 SU students and 12 UK students. The session, led by Assistant Professor Michelle Sizemore of the UK English department, allowed the students to engage in cross cultural dialogue and communication. "The best part about the summit was simply the opportunity to connect with these other students and learn from them," Simms said. The conversation that had the biggest impact on her was a discussion about eye contact. "There was a particular passage in the book that we read dealing with eye contact, and we were talking about how, as American students, we are trained that eye contact is a sign of respect and often intelligence or power," Simms said. "It is seen as positive, especially in business relationships. However, the Chinese students talked about how sometimes if you make eye contact with someone that you don't know very well, in their culture, it's perceived as disrespectful because they consider it very intimate." The symposium also featured Professor Ron Pen of the UK School of Music, poet and Associate Professor Frank X Walker of the Department of English, anthropology Associate Professor Mary Anglin, and art Professor Arturo Alonzo Sandoval, who lectured and performed on topics surrounding Appalachian arts and culture. Simms said it was very an interesting experience to interact with and learn from UK faculty on another continent. Simms also completed coursework throughout her time in China, spending her first month participating the UK Education Abroad Conversational Chinese Language program, an intensive language immersion experience at Shanghai University. Simms engaged in four hours of intense language classes each day, along with cultural classes that focused on topics such as calligraphy and tai chi. "We got to really connect with the culture," Simms said. "We went to the Shanghai Circus, and we took trips to different small towns in China. It was really interesting to learn from that sort of holistic perspective, including both the language and the culture." Simms said that the best part of her experience, however, was the relationships she built with people she met in China, both the students at Shanghai University and her coworkers at the Lexmark-Shenzhen office. Her favorite anecdote from the three months took place on a team-building trip with her coworkers in the SBM department at the Lexmark-Shenzhen office. "For that trip, we went to a small city called Lianzhou, which was on the country-side; one of my coworkers was actually from there," Simms said. "And all of my coworkers wanted to bring home chickens from this area. So we drove five hours to this rural village, and we caught chickens and put them in boxes and brought them back with us on this long drive, which was absolutely hilarious. 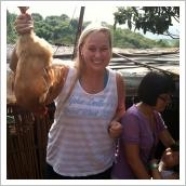 I have a picture of me, with my blonde hair, wearing my Alpha Delta Pi Shirt, holding a chicken outside in this rural Chinese village, and it was one of the best experiences I've ever had. I had been to Beijing and Shanghai, but this small city was like Georgetown, Kentucky (which is where I'm from) in relation to Lexington, and getting to experience rural China with a group of native Chinese coworkers was an unbelievable, unique opportunity." Simms said she returned to the United States with a new and refreshed interest both in Chinese language and culture. Though she partially expected to be burned out after her extensive time there, she said she developed a new interest and intrigue. More so now than ever, she hopes to find a career that allows her to interact with the Chinese on a regular basis. Carvalho said that the UK Office of International Affairs continues to foster international relationships and exchanges so students like Hannah can have these crucial, global experiences. "We look forward to watching Hannah's future successes," Carvalho said. "And we at UK are inspired to make such experience more and more available to all of our students,"